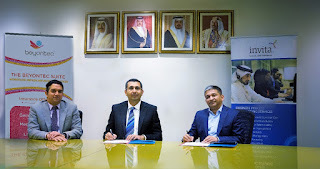 Dubai, United Arab Emirates, 23 April 2018, (AETOSWire): Bahrain based Invita Claims Management Company (Invita Claims) has signed a contract with global insurance IT solutions provider Beyontec to implement the Beyontec Suite, a core system that can automate the processes and transactions necessary to administer faster third-party claims services in the country. Invita Claims is a CBB licensed Third Party Administrator (TPA) that will offer motor claims administration services to insurers in Bahrain. Using Beyontec’s fully developed, totally integrated and highly configurable, real-time claims administration system, Invita Claims aims to automate and streamline the TPA claims management process, reducing the turnaround time while improving service to customers. Insurance companies working with Invita Claims can now benefit from accelerated cash flow, and reduced costs associated with managing TPA claims.